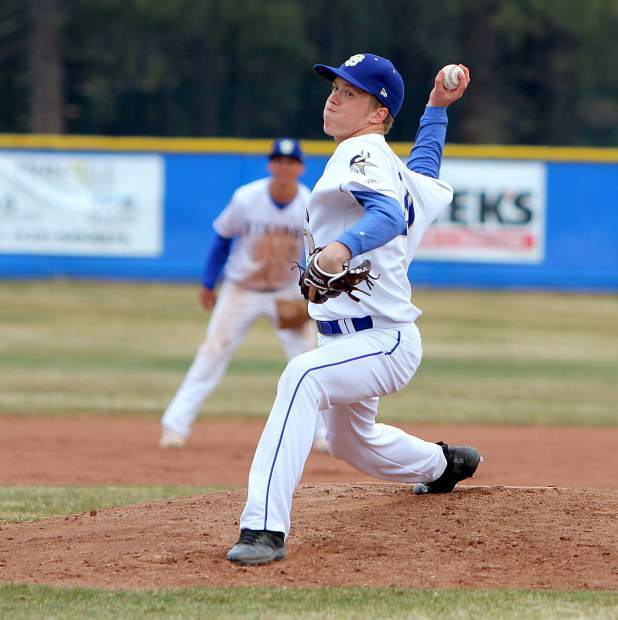 South Tahoe pitcher Auston Burdick delivers a pitch earlier this season. 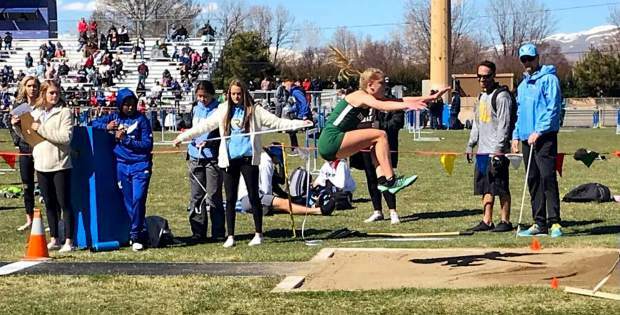 Burdick earned the win Friday, April 27, against Fernley at South Tahoe Middle School. 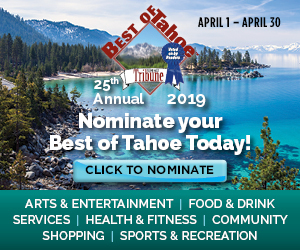 For the sixth straight season, South Tahoe will be one of the six teams in the class 3A Nevada Interscholastic Activities Association Northern Region playoffs when they begin later this month. Chris Pfister continued his dominance on the mound Saturday, April 28, tossing an eight-inning 3-hit shutout to help the Vikings clinch a spot in postseason with a 1-0 victory. 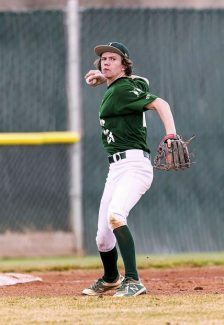 Pfister also provided the game-winning hit in extra innings in the nightcap of a doubleheader against the Fernley Vaqueros at South Tahoe Middle School. Pfister (5-1) has allowed just two earned runs on 17 hits and three walks in his last 27 innings pitched while striking out 21. He has won four straight starts. South Tahoe senior Peyton Galli reached on a fielder’s choice in the bottom of the eighth. He promptly stole second to get in scoring position. Pfister stepped up with a big hit sealing the win. “It was great for him, and for all of our seniors,” Teevan said. Galli had two hits and Aaron Johnson added a single. In the twinbill opener, the Vikings didn’t hit much and when they did, it wasn’t in key situations. Fernley (10-11 Northern) jumped out to a 3-0 lead but the Vikings scored three runs in the third to tie the game. 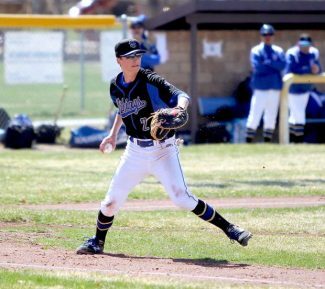 For the offense, Galli had two hits, including a double, Jaden Aquino and Pfister each added RBI singles, Bryin Schouten singled, Cameron Johnson and Kevin Lehmann each scored and Alex Kasper had an RBI. Aquino started on the mound and Teevan said he did a good job of throwing strikes but his defense made some mistakes that led to unearned runs. In the series opener Friday, April 27, it was all South Tahoe. The Vikings received several free passes to first base and cruised to a 14-4 victory in seven innings. The Vikings had only three hits, a bases clearing triple from Cameron Johnson a double from Lehmann and single from Schouten. 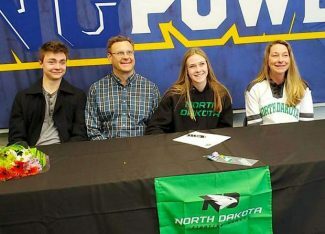 Lehmann also walked twice and scored three runs, Schouten scored three times, Pfister drove in two and scored twice and Kasper scored twice and drove in two to lead the Vikings offense. Vikings hurler Auston Burdick worked the first five innings for the win, allowing three earned runs on seven hits while fanning two. The Vikings (16-11, 13-10 Northern) played their last regular season game Tuesday, May 1, at Dayton (10-10 Northern). With a win, South Tahoe would wrap up at least the league’s fourth seed. They are not likely to move past Truckee (12-8 Northern) who plays Sparks (0-20 Northern) once and Lowry (9-12 Northern) three times to close out the season. If they end up tied, the Vikings own the tiebreaker after beating the Wolverines twice in three games. Churchill (16-5) and Elko (15-6) are battling for the league title and top two seeds.